It's tempting to concentrate on making new sales or pursuing bigger accounts. But attention to your existing customers, no matter how small they are, is essential to keeping your business thriving. The secret to repeat business is following up in a way that has a positive effect on the customer. Effective follow-up begins immediately after the sale, when you call the customer to say "thank you" and find out if he or she is pleased with your product or service. Share these tips to your followers as a graphic. 1. Let customers know what you are doing for them. This can be in the form of a newsletter mailed to existing customers, or it can be more informal, such as a phone call. Whatever method you use, the key is to dramatically point out to customers what excellent service you are giving them. If you never mention all the things you’re doing for them, customers may not notice. You are not being cocky when you talk to customers about all the work you have done to please them. Just make a phone call and let them know they don’t have to worry because you handled the paperwork, called the attorney or double-checked the shipment -- one less thing they have to do. 2. 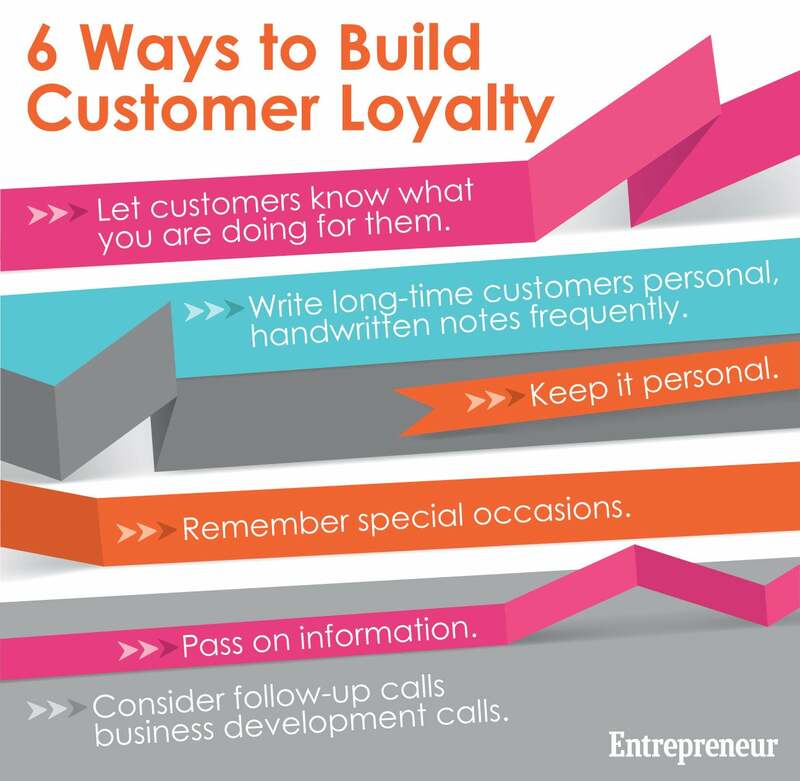 Write long-time customers personal, handwritten notes frequently. "I was just sitting at my desk, and your name popped into my head. Are you still having a great time flying all over the country? Let me know if you need another set of luggage. I can stop by with our latest models anytime." Or, if you run into an old customer at an event, follow up with a note: "It was great seeing you at the CDC Christmas party. I will call you early in the new year to schedule a lunch." 3. Keep it personal. Voice mail and email make it easy to communicate, but the personal touch is lost. Don't count these as a legitimate follow-up. If you're having trouble getting through, leave a voice-mail message that you want to talk to the person directly or will stop by his or her office at a designated time. 4. Remember special occasions. Send regular customers birthday cards, anniversary cards, holiday cards -- you name it. Gifts are excellent follow-up tools, too. You don't have to spend a fortune to show you care. Use your creativity to come up with interesting gift ideas that tie into your business, the customer's business or his or her recent purchase. 5. Pass on information. If you read an article, see a new book, or hear about an organization that a customer might be interested in, drop a note or make a quick call to let them know. 6. Consider follow-up calls business development calls. When you talk to or visit established clients or customers, you'll often find they have referrals to give you, which can lead to new business.